Anticipating FDA intervention, the makers of Four Loko have taken pre-emptive action and announced they will drop three ingredients--caffeine, taurine, and guarana. 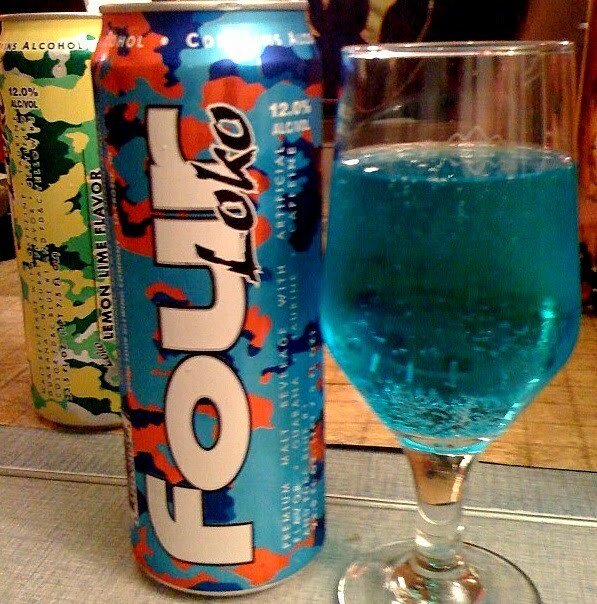 Ah, but before the era ends, I had to taste the Loko. For socio-historic purposes. By chance, when friends and I got together last night, someone else had the same idea, so we tried two flavors: Lemon Lime and Blue Raspberry. A third can of Cran berry Lemonade will remain in my private collection. I expected Four Loko to taste very sweet and artificial, like alcohol-spiked Kool-Aid. Bad, but in a familiar, semi-palatable way. Was I in for a surprise. 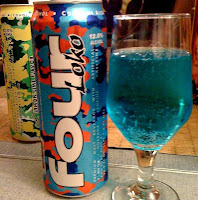 First off, as you can see from the photo, Four Loko comes in vibrant, unnatural colors that recall cleaning agents. That's Blue Raspberry, and the Lemon Lime was nuclear green. The aromas are even more unnatural--and powerful. We cracked the Blue Raspberry first, and I was startled when the scent filled the room. It's sickly sweet, but also harbors a chemical undercurrent. The flavor of Blue Raspberry was similar--again, sickly sweet, like Kool Aid. Predictable. But there's a lot more going on, and all of it is bad. A chemical fizz that has the quality of burning. Then we turned to the Lemon Lime, which I assumed (again, incorrectly) would be more palatable. Citrus is both a relatively palatable synthetic flavor, and also good at covering up other flavors. Not in Four Loko, though. The smell was even stronger--and so unnatural that it triggered my lizard brain to mark it as a poison. The top note is Kool-Aid again, though more like a cheap, dollar-store brand. Then comes a toxic underlayment of Mr. Clean, tree car-freshener, and lime Jello all bound up by that acid-like fizz. Absolutely undrinkable. I have no idea about the effect of Four Loko on the human body, because I had just a couple swallows of each "flavor." Younger and hardier people can test the product for those properties. Having bore the burden of drinking roughly a can and a half of Four Loko, I can testify that it comes loaded with a remarkable hangover. Also, I had some sort of weird body rash when I woke up this morning. Like most alchohol I thought it would get better the more I drank, but it seemed to have the opposite affect - the burn just got worse and worse. I look forward to your upcoming reviews on paint thinner. Awesome post, Jeff. It reminds me of Christopher Hitchens volunteering to be waterboarded for the edification of Vanity Fair readers. You have taken the fall so we don't have to. Save that can of Cranberry Lemonade until a pleasant evening when you can put Justin Bieber's CD on and fist-pump to the hilarious antics of "Jersey Shore." Thanks for the tip Ben. Though I will try it as a paint stripper first. On a more related note. Four Loco is why we need blogs like this. Post-Loko, Day 2: I'm still a bit hungover. Sometimes I can still taste it in the back of my throat. - contrary to what one might think, the citrus flavors are the worst. Fruit punch is much more likely to be a palatable flavor. However, they're still gross. - they work. You get drunk. And wired. Fast. - somewhere between 32oz and 48oz, something horrible happens. Not only will you probably be getting drunk and wired, but it also makes you completely insane. Seriously. I'm only one of many who have noted this. The combined effects of three Sparks (or two Four Lokos) can be unreal. - as drug delivery systems go, they are significantly better than needles and for most people at least marginally better than smoking, and that's good enough for me. Of course, I won't really miss them till next summer. Winter is for Spanish coffees, duh!